What really happened at the Auburn-LSU ‘Earthquake Game’? It’s that time again—time to recycle for the fourth fifth seventh year in a row (but for only the second third fifth time on this site!) the truth behind the “Earthquake Game”, time again to try to justify that all-nighter at the library in 2007 and to make excuses for the writing that came from it. Time again to beat LSU. Time again. The 1988 Auburn-LSU game was the first time I cried over football. It was October 8. I was nine. The game was on ESPN. My Dad, my uncle and I sat stunned, an empty Pizza Hut box in front of us—no more pizza, no more hope. I hopped out of the recliner and ran up-stairs. Dad found me bent over the toilet in the dark. But beyond my first true taste of mortality, the ’88 game—the so-called “Earthquake Game”— is most notable for the retroactive apotheosis of the not-so-peculiar incident to which it owes its nickname. Weird things were happening in 1988, sure. The fifth season of The Cosby Show had premiered just two days earlier and it – Cosby! – had actually slipped in the ratings, down 19 percent from the previous year (though it still controlled 40 percent of the audience share) and Theo’s voice-change was about to rock America. But was there a freaking earthquake inside Tiger Stadium the night of Oct. 8, 1988? The game was on ESPN, which had been pressuring LSU to move the scheduled 6:15 pm kickoff to earlier in the afternoon; an afternoon game meant more money, more money for everyone. But compromise the vaunted nocturnal punch to Death Valley’s home field advantage, which LSU’s 1988 media guide called “the most dreaded in America”? LSU said no way. As for that last bit, on that night, LSU fans to this day beg to differ. Down by six with no timeouts and 1:47 left to go in the game, LSU quarterback Tommy Hodson, who was described in one recap as “looking like a high-schooler for 3 1/2 quarters,” zipped a do-or-die fourth down bullet to tailback Eddie Fuller over the zone-playing heads and fingers of one of the most ferocious Auburn defenses ever. Fuller was waiting in the back of the end zone for his third chance to catch the game winner. He caught it. The extra point, David Browndyke’s 69th in a row, was good. It capped a 74-yard game-winning drive. Until then, LSU had failed to cross the 50 yard line. The stadium erupted. I vomited. Final score: LSU 7 – Auburn 6. The two teams wound up sharing the SEC championship, LSU with a final record of 8-4, Auburn with a final record of 10-2, losing again only to Florida State in the Sugar Bowl. And that was that. The gist of the legend is that on that night the noise and commotion of the celebrants in Tiger Stadium, yep, produced a minor earthquake. I was curious about what had actually happened, what had actually ruined that night, and I set out to perform an autopsy on that small piece of my soul, 19 years deceased. I didn’t remember hearing about any earthquake at the time. But I was young. I just remember the pain. … but there was nothing to be found in the pre-game newspaper build-up nor post-game coverage of the ’89 game either, none at least in the papers I had time to peruse for details (The Auburn Plainsman and The Birmingham News). So I Googled. And I found the name of the seismologist credited with the discovery of the quake. And I found his e-mail address. And my focus shifted from what happened to what didn’t happen. The structure of the modern Earthquake Game meme, at its most extreme, inspires visions of delirious LSU fans actually and immediately aware of the event, if not, in some way, actually channeling it. Not that anyone in the stands revised their memories to include descriptions of a Hollywood-style earthquake, but much of the current literature specific to “The Earthquake Game” seems easily adaptable along those lines. For instance, the very name of the LSU blog “And The Valley Shook“, in addition to showing just how important and rooted the game has become in the LSU psyche, almost implies a game-changing phenomenon, invested with the supernatural, and immediately perceived as such by LSU fans, rather than an after-thought piece of trivia (which is what it was). Still, for LSU fans and even Auburn fans (if only for apparently being LSU’s only earthquake-worthy opponent), the sublime aspects of such a story are pretty irresistible. They were definitely irresistible to ESPN. Don Stevenson, a seismologist working for the Louisiana Geological Survey but technically employed by LSU, wasn’t at the game that night. He was at home, less than a mile from LSU’s campus. He didn’t watch the game on TV. He didn’t listen to it on the radio. He did hear a “tremendous roar” come from the direction of the stadium at one point in the evening and later discovered that LSU had won their football game with a last-minute touchdown. The following Sunday morning, Stevenson woke up like the rest of the world. I went to church to petition the Lord for understanding, he headed to LSU’s Howe-Russell Geoscience Complex to change the recording charts in the seismic laboratory (they’re changed daily). Anyone up on Earthquake Game lore is likely aware that the “quake” was discovered after the fact, but they’re also likely ignorant as to just how much time passed between the event and hearing about it. How long was it before the story got out? Although acknowledging that the seismic activity attributed to the football game was, because of his display, quasi-common knowledge around his particular ward of the geology department, Stevenson attributes its public dissemination to an ESPN hype-umentary filmed sometime prior to his leaving LSU in the summer of ’91. At some as yet undetermined point in the early 90s, the 1988 Auburn-LSU game was forced from its quiet home in the LSU win column, and now roams the cyberstreets of football folklore, cartooned with embellishments and hunted by sound bite snipers whenever a big game comes to Death Valley. None of the games are more famous because none of the games have been more pimped by ESPN. But if we look at the original pre-pimp context, the actual on-the-field narratives of the two games following the 1988 game are just as compelling, if not more so. The next game was at Auburn in 1992. LSU trailed by 20 points going into the 4th quarter but, led by freshman quarterback Jamie Howard, mounted an amazing comeback to take the lead with 1:48 left in the game – just a few seconds more than Auburn had for its comeback attempt in 1988. This time it worked. Auburn’s “150 pounds when wet” Scott Etheridge kicked his 5th field goal of the day with 8 seconds left to win the game for the Tigers, the good ones, 30-28. In their original context, these three, thrilling games were for a short while referenced in similar terms and tone. First reference to “Earthquake Game” I found—from 1993. 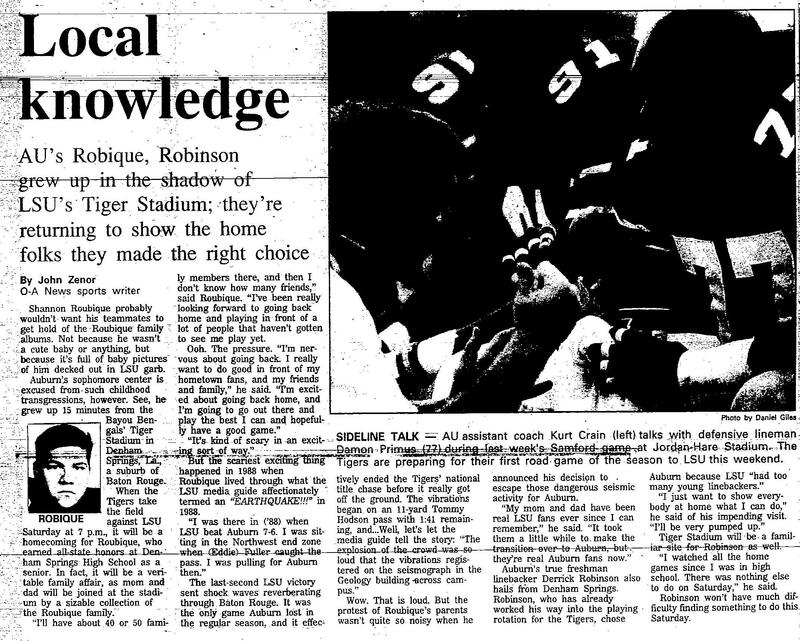 Combine that with my failure to find any instance of “Earthquake Game” trivia until a short piece on Auburn center and Baton Rouge native Shannon Roubique (who was at the ’88 game and would go on to play in the ’94 game, the most amazing of them all) published the week of the ’93 game in the Opelika-Auburn News, and the modern and somewhat metaphorical legend surrounding the “Earthquake Game” quickly becomes not the magical night you met your wife, nor even the crazy night you technically met your wife but were too drunk to remember her, but something more along the lines of the pretty fun concert which you discover after a few years of marriage you both attended as kids. I’m not questioning that whatever happened inside Tiger Stadium that night was recorded by a seismograph machine located approximately 1,000 feet away in a manner consistent with recordings of small earthquakes. It’s just that, embedded in the myth now surrounding that night isn’t just the idea that it had never happened before at Death Valley or anywhere else, but that it also hasn’t since and never will. Without that, the “Earthquake Game” becomes simply “The Game”, or at best “The Original Earthquake Game.” For LSU fans, the belief that it is the only begotten earthquake of the football gods is essential to the legend, and it’s an easy belief to cling to when backed up by the for-the-cameras bravado of actual LSU geologists. “I don’t see why not,” Stevenson says. (And he’s not alone). A colleague of both Johnston and Stevenson actually oversees a program dedicated in part to recording the seismic activity generated from the football fervor inside Tiger Stadium. Recordings corresponding to most of LSU’s 2006 home games, recordings similar to the one produced the night of the “one and only Earthquake Game,” can be accessed on the project’s website – the project is of course called Seismeauxgraph. Maybe, as an Auburn fan, I can’t see the forest for the trees. Maybe I’m just looking for my facts in the wrong places… and Lord knows I’ve only scratched the surface of the literature pertaining to that game. But everything I have scratched over the past few days leads me to believe that the belated publicity about that peripheral quasi-geological occurrence has, in a sort of asterisk devouring the essay sort of way, artificially inflated the significance of the actual game in the minds of LSU and Auburn fans alike, myself included. Today, Hodson and Fuller say that after 15 years, the 1988 LSU-Auburn game is still an earthshaking experience. In fact, both say the famous play is even bigger now than it was then, since it has taken on a life of its own as part of LSU folklore. Fuller said he first began to realize how amazing the “earthquake” game was when he saw it featured in a Ripley’s Believe It or Not Museum in the early 1990s. “I was going through this Ripley’s museum in Niagara Falls, and I looked up and there it was!” he laughed. Apocryphal? A question of semantics? Whatever the true origins and chronology behind the news cycle of the event, the idea of the “Earthquake Game” still makes for a great story, and sure, one to brag on, not only to continually amp up the rivalry but as a trophy of fandom, an antenna for college football myth entire. Though for me, the throwing up and the crying is more than enough to remember it by. I can only wish the same for some little bayou boy this Saturday night. 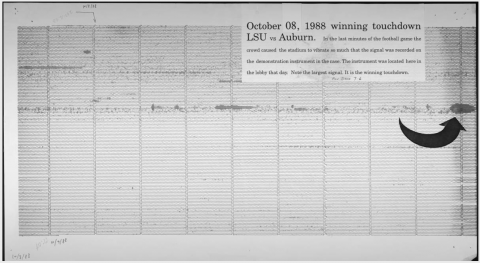 Seismograph scan via LSU Archives. According to a recent fan poll, Hodson’s touchdown pass ranks as the 2nd biggest play in LSU history! And I mean, it’s cool and all, but can you imagine an Auburn blog, attempting to capture in its title a single-phrase summation of “Hell Yeah” Auburn Spirit, named “And the Cigars Were Smoked”? This wouldn’t have been a GameDay segment, as the show wasn’t broadcast from Baton Rouge until 1995. It wasn’t. The teams didn’t play in Baton Rouge again until 1993, a 34-10 Auburn route. In the Auburn Plainsman and the Opelika-Auburn News. Despite Hodson’s recollection, Anderson feels “pretty certain that [news of the seismogram] did not become widely known until the ESPN piece came out.” Hodson graduated from LSU in 1990. Anyone on The Reveille staff want to find out if he’s right? My favorite memory of the game — and only redeeming quality of it — was the shoot of a friend from Auburn standing in disbelief as a crowd of LSU fans above him. In true rude form, he sees that he is being filmed them points at his crotch — catching the entire nation on a MEAT GAZE. Best article I’ve read in years. Actually the seismogram is kept in Hill Memorial Library along with many other LSU treasures. You guys can relax. I retired last month and I’m the last guy who knew the story. I too was a student in the North End Zone student section for this game. I totally agree wit LSUfan247’s remarks on the game. The bleachers we were on did give way as we jumped and hollered. My husband lived in an apartment in the stadium at the time and says that things in his dorm room were knocked off the shelves and pictures fell off the cinder block walls. The whole place just SHOOK. The Reveille did run the story that week. 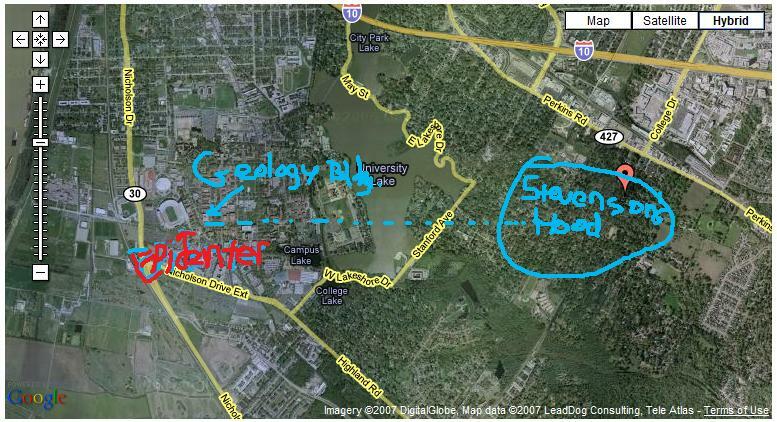 My father was a geologist for Texeco and I remember bring it home and discussing it. The story may not have caught fire for a few years but the student body sure knew about it. May not be the greatest play in LSU history, but it is certainly a game I remember 25 years later.